Keith Mitchell holds up his trophy after winning the Honda Classic on Sunday in Palm Beach Gardens, Fla.
Keith Mitchell celebrates as he sinks his putt on the 18th hole to win the Honda Classic on Sunday in Palm Beach Gardens, Fla. Mitchell, a Chattanooga native who played for Baylor School and the University of Georgia, earned his first PGA Tour victory, holding off Rickie Fowler and Brooks Koepka for a one-stroke win. Keith Mitchell, right, celebrates with his caddie, Pete Persolija, after making a birdie putt on the 18th hole to win the Honda Classic on Sunday in Palm Beach Gardens, Fla.
PALM BEACH GARDENS, Fla. — Keith Mitchell's first and, until Sunday, only win as a professional golfer happened three years ago on something called the G Pro Tour. As is the case with mini-tour life, hardly anybody was watching and hardly anybody noticed. He earned $5,600. Those days are long gone. The 27-year-old Chattanooga native, a former Baylor School and University of Georgia standout, gave himself a raise and a promotion at the Honda Classic. After 97 tries on the PGA Tour, the Web.com Tour and even the Latinoamerica Tour, Mitchell is finally a winner at the highest level of the sport — and he had to outslug two of the game's best players for that long-awaited victory. 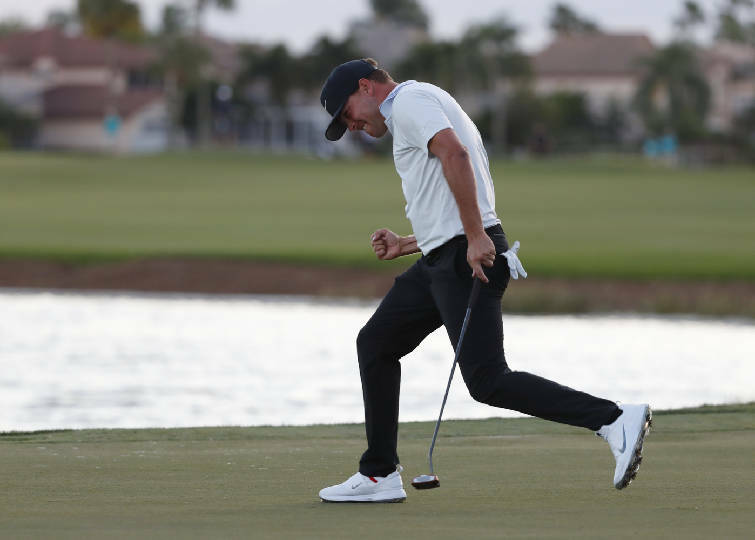 A birdie on the par-5 18th of the Champions Course at PGA National capped Mitchell's one-stroke win as he held off Brooks Koepka and Rickie Fowler. With the breakthrough victory, Mitchell earned 500 FedEx Cup points, $1,224,000 and some major job security, a fact he emphasized in his news conference afterward. "The first thing I thought about," he said, "was having a job for these next 2 1/2 years on the PGA Tour." Mitchell secured the 27th PGA Tour win by a former Georgia Bulldog since 2010, and his win obviously gave special pride to Baylor as well. Mitchell is one of four former Red Raiders currently on the top-level tour, with Harris English, Stephan Jaeger and Luke List the others. One year after List lost a one-hole playoff to Justin Thomas at the Honda Classic, Mitchell avoided one. "(Mitchell) was senior class president my first year (2009-10)," Baylor headmaster Scott Wilson told the Times Free Press on Sunday. "I am so proud of him." Mitchell birdied four of his final seven holes, including a 15-footer on the 18th for a 3-under-par 67 and a 9-under 271 total. Fowler (67) and Koepka (66) made big charges as well on a wild and windy day, yet they settled for a tie for second. "It was awesome," Mitchell said. "I wish that I could come up with a better word than that, but just having a chance to come down the stretch against Rickie Fowler and Brooks, those guys are the best in the world, and they've been out here proving themselves. And I'm just pleased that I could prove myself against guys like that." 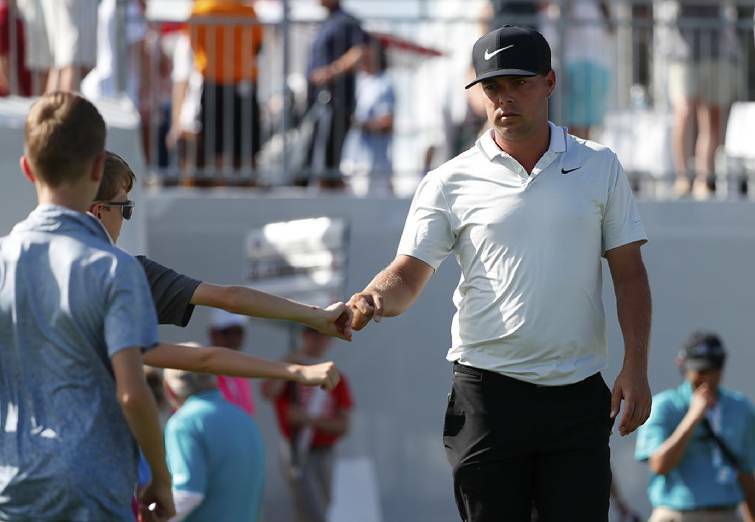 Fowler gave Mitchell a warm embrace when they crossed paths after the final putt. "Awesome guy," Fowler said. "Obviously, a good enough player to win." Koepka and Fowler both birdied the 18th. Fowler actually birdied three of his final four holes, including a 45-footer on the 17th. But Mitchell didn't waver in the wind. "Everybody dreams about having that putt on the 18th hole to win a tournament," Mitchell said. "And I had it today." What were his thoughts standing in the 18th fairway? 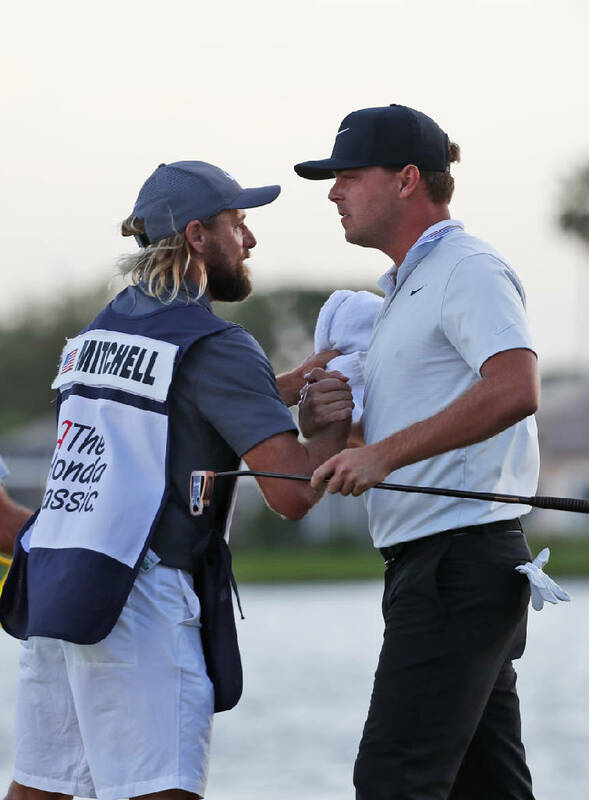 "If I make par here, I've got a playoff with two of the best players (Fowler and Koepka) in the world and potential Hall of Famers," Mitchell recalled in his news conference. "That's a big thought for a guy in his second year on tour who's never won." Fellow Baylor grad English had a solid day, too, finishing tied for 12th at 3 under after closing with a 68. Lucas Glover (66) and Ryan Palmer (63) tied for fourth at 7 under — and for a while, it appeared Palmer might steal the tournament. Palmer was tied for 48th after the opening round, tied for 51st after 36 holes and tied for 39th when the final round began. But he started with four straight birdies on the way to going out in 29 — the first player to ever do that in a final round at the Honda Classic. He rolled in a 25-footer from just off the green for birdie at the par-4 16th, then stuck his tee shot to six feet from the cup and made birdie at the par-3 17th. When he finished at 2:32 p.m., he was two shots back and the final group was on the fifth hole. "I've got an outside chance, for sure," Palmer said when he was done. About two hours later, he was in the outright lead. Not long after that, he was in a six-way tie atop the leaderboard. And his chance lasted until 5:07 p.m., when Koepka tapped in for birdie on the last and took the clubhouse lead at 8 under. Koepka was good. Fowler was good. Mitchell was just one swing better. "It was good for the fans," Koepka said. "They got what they wanted, a good tournament, two of the bigger names coming down the stretch and having a chance to win. That's what this golf course will do." Singh, the 56-year-old who was bidding to become the oldest winner of a PGA Tour event ever — Sam Snead was 52 when he won the 1965 Greater Greensboro Open — was right there until the end. Singh, who hasn't won on this tour since 2008, settled for outright sixth after a 70. "If I'm anywhere near a golf course at 56," Mitchell said, "I'm going to be excited." Clark, the third-round leader, was two shots clear of everybody when he made an uphill putt from just right of the green on the par-4 4th, with that birdie putting him 9 under. Then he made bogeys on four of his next eight holes, falling off the pace. Mitchell went from 102nd to 17th in the FedEx Cup standings and from 95th to 16th on the PGA Tour money list for the 2018-19 season, and he is expected to climb into the top 70 of the World Golf Ranking. He was No. 162 entering the tournament and has never been above No. 130. That's just one of many things that will change now. His previous biggest check as a pro was for $400,400 last year when he finished third at the Byron Nelson. This check is more than triple that. He's going to the Masters. He's exempt for two more seasons. Perhaps the biggest prize is this: Mitchell will never again have to wonder if he can win. "Having status for a couple more years, putting myself in a really good position for the Tour Championship, getting to play in the four majors, or some of them I guess I don't even know what it gets me," Mitchell said. "It's awesome."